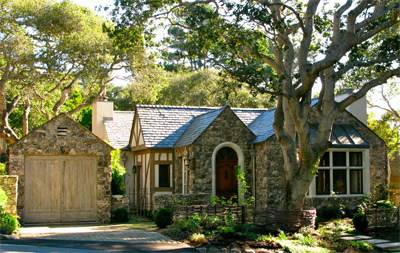 It is January 2009 and I am taking my usual Carmel morning walk when I see that a wonderful new cottage has sprung up during my absence. Unlike some of the newer homes, this one does not overwhelm its lot or its neighbors but sits comfortably behind a unique wattle fence. Wattle fences are made by weaving flexible green sapling wood between upright posts, like a wooden tapestry, so they’re both beautiful and strong. They were originally used to contain domestic animals, such as sheep. These days, wattle weaving is a great way to build all kinds of useful rustic garden accents from sustainably harvested wood. The garden is in its infancy and I make a note to check its progress from time to time. By the late summer of 2010, this is already a smashing cottage garden. Climbing roses cover the garage. The wattle fence is obscured by plants. I love the wattle tuteur that supports roses. Ferns and dahlia grow in harmony. This is a visual feast. This August of 2011, I eagerly make my way once again to the cottage to see the garden. I am in luck. When I peek over the iron gate, I see one of the owners bathing his dog. We chat about the house and its design for over an hour. He gives credit to his wife, Linda, and promises to give her my card when I ask if I might photograph the garden. Linda is a busy Interior Designer with offices in The San Francisco Bay area and Carmel, but she makes time to call and give me permission. I wait several days until I get some soft light provided by incoming fog, grab my camera and walk to Biddlestone Cottage. The Floyds once drove through a village in Northumberland England named Biddlestone and tucked the name away for a cottage yet to be built. I approach the front door, with its ornate knocker. The front stoop has a boot-wipe and small ornament. Baby tears grow between the stones. I later find that the stone for this house comes from Provence and that Linda loves all things French. The wattle fence is almost covered now by plantings. This is a very skillful planting plan. Meticulous attention is given to the spots of sun and shade and so sun-loving dahlias and roses as well as shade loving foxgloves, fuchsia, and geranium thrive. With a backward glance toward the garage, I start down the path to make my way through the garden. 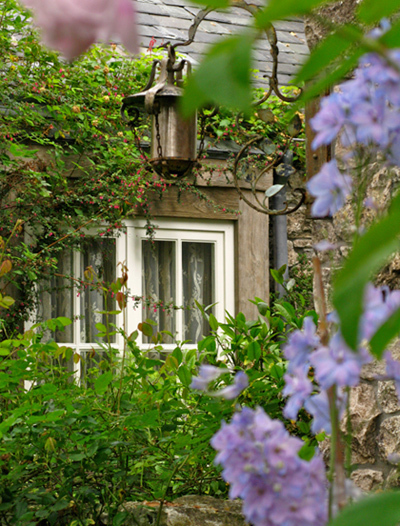 The front window has leaded glass, with a scalloped tin detail. I round the corner to see that this garden takes advantage of every inch of planting space. Vines climb the walls. Plants carpet the ground between the stepping-stones, and spill out of pots. The patio area on the south comes into view.